I am a reward based trainer. What’s that mean? It means I reward the dog when it does something I like. Science shows us that any behaviour that is rewarded will happen again and again. Behaviour that is not rewarded will go away. For example, I call my dog and each time he comes to me I reward him with a treat and then send him off to play again. I call him again and reward. I keep kibble in my pockets so that I can continually reward my dog for coming. Not only does he come when called, but he often come over to me just to check in. This is how positive reinforcement works and it has amazing power! However, positive is not permissive. I expect my dog to come when called; I expect him to automatically sit for anything he wants (‘say please’); I expect him to behave in a well mannered way, always. My training philosophy involves rewarding good behaviour and teaching the dog to control himself. All animals make choices constantly; choice based training teaches the dog that making the right choice is very rewarding indeed. In the words of Sarah Kalnajs (see article below), "I would rather feed my dog for ever, than cause him pain forever". Reward the behaviour you want; interrupt or ignore the behaviour you don’t want; manage the behaviour you cannot ignore (or have not yet trained). There are many myths out there about dogs and how to train them. Here are some of the more common myths. There are as many answers to that question as there are dog trainers. But, there are also some hideous techniques described as “positive” when they are anything but positive from the dog’s perspective, and isn’t that really the criteria by which we need to judge? After all, how would you like to have something quite aversive happen to you, only to be told that it was actually positive? If you think that’s all right to do to dogs, would it be all right if you were an arachnophobe to have someone force you to hold a spider in your hands all the while trying to convince you what a positive experience you were having? Dog training is fraught with all kinds of people, because it is an unregulated profession. Want to train dogs and make money? Hang a shingle because that’s how easy it is. So, the next time someone tells you they are a trainer and they want you to try a particular technique on your dog that sounds as if it isn’t very positive, question their judgment the same way you would if they told you to pour sugar into your gas tank. If the technique involves shock, pain, or fear, trust your instinct that it isn’t positive, and RUN AWAY. Training a dog is like training any other animal that is capable of learning. That means that operant conditioning and/or respondent (Pavlovian) conditioning work. Without getting too much further into the science, suffice to say that a dog trainer who explains their technique in lay terms should be equally able to explain and justify it scientifically for you. 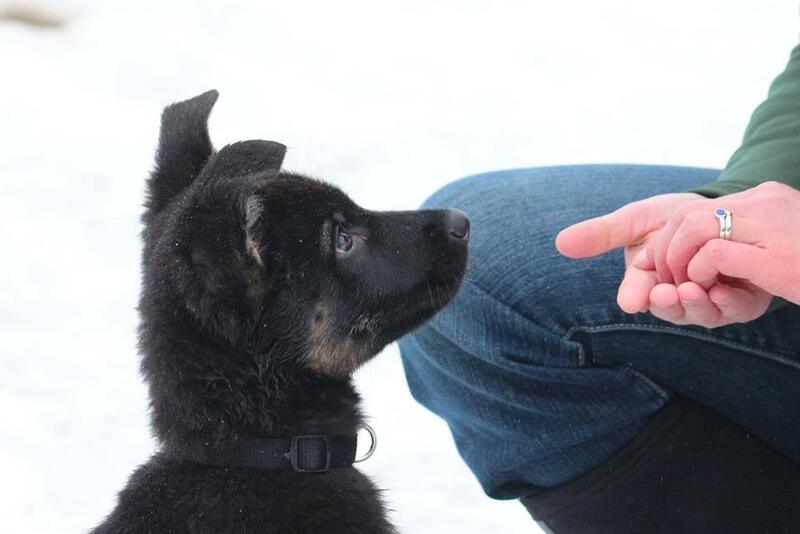 ASK that the trainer specify what quadrants of operant conditioning will be in use during the training of your dog. If the trainer really is committed to so called “positive” training, the response should be that positive reinforcement (R+) and negative punishment (P-) are the quadrants in use. Don’t get me wrong, the other quadrants work, too, but the ones I mentioned as positive usually involve reinforcements such as food, toys and privileges. Negative punishments such as the removal of a food item, toy or privilege are actually “positive” techniques. By contrast, positive punishment (P+) often involves the application of coercion, such as a leash jerk, a shock, or a reprimand to reduce an unwanted behavior. Negative reinforcement (R-) involves the removal of an aversive stimulus to increase a particular behavior. Many trainers who use the P+ and R- quadrants have co-opted some very “positive” language for use on their web sites. They fully well understand that most dog owners do not want to hurt their dogs, so they couch coercive techniques in non-threatening language such as “freedom training” or “balanced training” or “remote training.” Shock collars have become remote, correction, reminder collars, and the aversive shock they administer has become a reminder, a stimulus or a tap. One fairly well known Australian trainer, who shall go nameless in the name of my desire not to trainer-bash, has the words “positive training techniques” on his site despite the fact that, in his book, he recommends “a sharp cuff on the rump” as one of those positive techniques. Another trainer was recently found to be holding classes that owners signed up for only to find out upon arrival at the so called positive class that it was actually a shock collar class. Buyer beware – everything that is labeled positive is not positive. How, in this highly unregulated environment, can a dog owner find a trainer who is knowledgeable, and who will actually use positive training techniques? It used to be that people were directed to find a “certified” trainer, but there is no national standard for certification, and the ubiquitous CPDT or CPDT-KA designation can include people who use techniques that are not positive. In fact, the Certification Council for Pet Dog Trainers (CCPDT) has questions on their test about the use of shock collars, and has not adopted a stance against the use of shock, so although many of their certificants have rejected shock collars, the public still has no guarantee. IACP, the International Association of Canine Professionals, has the most shock collar trainers of any major organization in its ranks, and proudly showcases Cesar Millan on its home page. Millan has been known to use P+ techniques such as helicoptering, leash jerks, kicks, shock collars, prong collars, and pinning. Members of IACP agree to reject the banning of any training tools. Thus, in this writer’s opinion, they tacitly support shock collars. NADOI (National Association of Obedience Instructors) is the oldest certifying organization in the United States. NADOI does require supportive evidence of a trainer’s abilities and experience, but expressly prohibits members from criticizing other trainers or their training methods. Thus, again, they may be tacitly condoning less than positive tools in the toolboxes of its trainers. In the interest of transparency, I am a CTDI. Certified Trick Dog Instructors (Do More with Your Dog program operated by Kyra Sundance) are required to use positive training and avoid shock collars, etc. in training trick dogs. However, there is no prohibition on the training of foundation behaviors, such as sit, down, or stay, by using shock collars, which many of us are disturbed by. So, some of us are all positive and some are not. To my knowledge, APDT membership in the United Kingdom is more of a guarantee that a trainer does use positive training. In the United States, two professional organizations that require its trainers to shun the use of prong, choke, or shock collars are the Pet Professional Guild and Victoria Stilwell Positively. The nice thing about Pet Professional Guild is that they also admit other dog professionals, such as groomers and veterinary technicians, as well as pet owners who support force free training. If your trainer attended one of the following schools, it’s fairly certain that they have a good grasp of the science and an understanding of why positive training makes the most sense: Academy for Dog Trainers, Companion Animal Sciences Institute, Karen Pryor Academy, Pat Miller’s Peaceable Paws. There are others, but the word “K9″ rarely shows up in schools that use purely positive training. Pet owners who are regaled with the old “I got spanked and I turned out all right.” line, or who are made to feel like bad pet owners for not wanting to “correct” their dog’s behavior, need to remember that we’ve come a long way in other things that used to be commonplace. Before 1964, virtually no one had seat belts in their cars. Now, most people don’t go to corner store without buckling up. Then, teachers could hit children with rulers, now children are disciplined in other ways. While people argue that corporal punishment works, a meta-analysis of published science showed that “immediate compliance” was achieved and perceived as desirable, but that there were many problem behaviors associated with its use that were undesirable. In dog training, shock collar trainers often brag about their immediate results, too, but are silent about the unintended consequences of that global suppression of behavior (learned helplessness) or behaviors that might “pop” out at inopportune times. They rail against the use of food and tell people they’ll have to carry food all their lives, but conveniently forget to tell them that they’ll be using that shock collar in the same way – dogs, being good discriminators can quickly learn “when the second collar is there” just as easily as they can learn “food pouch is on.” I’d rather feed a dog forever than cause him pain forever… Dogs need a high rate of reinforcement when first learning a behavior, and they need many repetitions to become fluent in a behavior. Positive training results in dogs that can exhibit complex behaviors or go around a rally or an agility course without needing a cookie after each obstacle! Trainers like Emily Larlham and Pamela Dennison prove it day after day.